There's a new wine bar opening up in the neighborhood and it may be in your own backyard. Many homeowners are enjoying a fresh twist in garden design - one that indulges their passion for outdoor living and their passion for good wine at the same time. By integrating vine-inspired features into their outdoor décor, wine aficionados and winery owners can create the perfect environment for savoring their favorite gifts from nature. "More homeowners are paying tribute to wine in their outdoor rooms because of what it represents to them," says award winning garden designer, Scott Cohen. "When people open a bottle of wine, they're not just sharing a drink, they're sharing an experience. They're enjoying good company, good conversation, and romance. They're making memories." Cohen has created a number of outdoor spaces for his wine enthusiast clients with his company, The Green Scene, a Canoga Park-based outdoor design and construction firm. 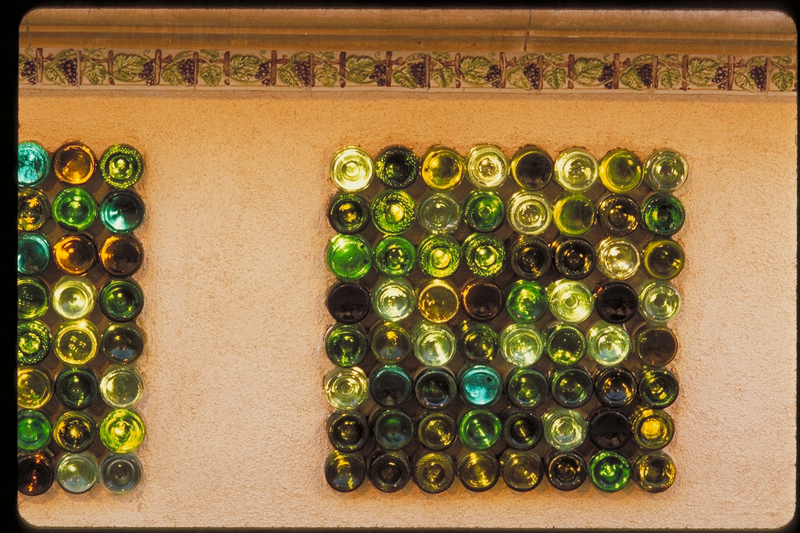 In his gardens, the bottles from favorite vintages offer a charming building material that sparkles like stained glass. 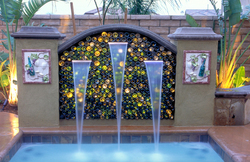 Wine bottle waterfalls glisten with multicolored lights. 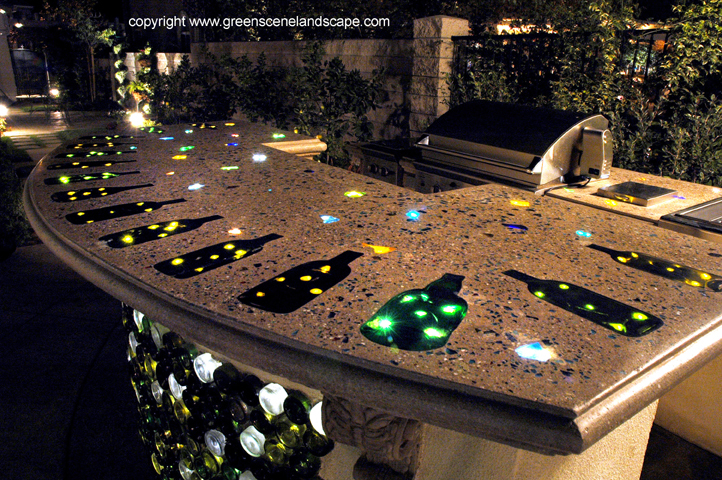 Countertops are inlayed with glass tiles created from the melted bottles of wine and spirits. In one, a grapevine mosaic of green and brown bottle glass weaves its way through shimmering clusters of glass grapes. Not only are these features a great way for wine lovers to share their hobby, they offer creative opportunities to reuse and recycle as well. "Recycling is a major component of our environmental philosophy and we're always looking for new ways to use old materials," says Cohen. "Those bottles represent good times with friends. Why throw them away when they make a perfect building material?" Whole bottles can be used somewhat like glass block. 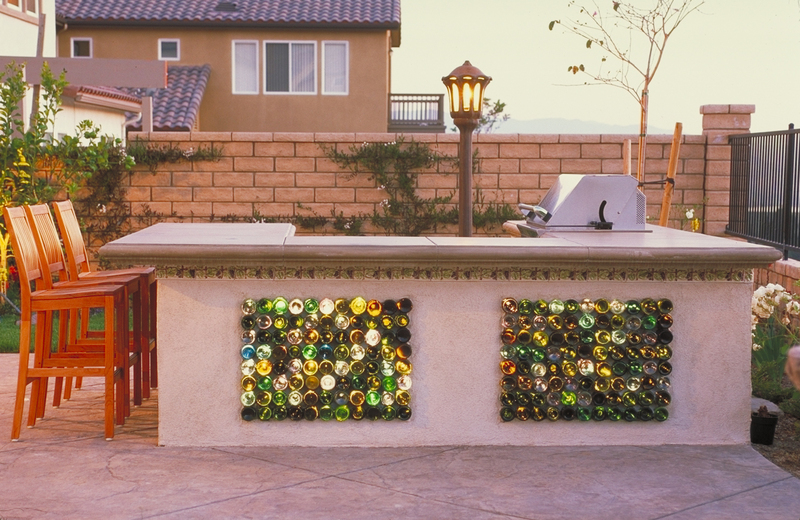 Cohen builds outdoor kitchen counters and wine-tasting bars by stacking multiple bottles on top of each other and fusing them together to create sturdy walls of glass that glitter like sunlit jewels. Bottles can also be melted down for interesting effects. In one project, recently featured on Home and Garden Television, a concrete countertop embedded with crushed recycled glass is adorned with a playful parade of glass tiles in the shape of wine and scotch bottles. Each is an actual bottle melted flat and polished smooth to fit seamlessly into the surface. "Melting glass is tricky," says Cohen. "If you catch it at just the right moment a bottle will melt but still hold its basic shape. It's the same bottle but now it's flat enough to serve as a unique glass inlay." Of course, men and women do not live on wine alone and some homeowners prefer to honor other beverages of choice. Cohen has created quite a few gardens for martini fancying clients as well. In one, a custom tile backsplash features a festive gathering of olives that seem to dance above a lively set of martini glasses. "This client told me straight up (pun intended), that he loves to make martinis," says Cohen. "So we stole a glass from his bar to create a mold for the martini tiles. We cut an olive in half to create a mold for the olives." Beneath the martinis stands an assortment of bottle-shaped tiles in every size and color. Each member of the family had a hand in painting these. The result is a joyful mosaic that sets the tone for high-spirited fun. While these outdoor rooms are striking at any time of day, a creative use of lighting can make them really come alive at night. Cohen combines low voltage lighting with fiber optics to create features that put on a captivating nighttime show. In one award winning project, he used innovative lighting techniques to add color and motion to a waterfall constructed of stacked glass bottles. Each bottle is outfitted with one or two fiber-optic cables. A hidden sparkler wheel sends soft ripples of glowing color through the water as it pours from the bottles. Even without the special motion effects, people enjoy playing with light. "Anytime you add light, you also add entertainment value," says Cohen. "When you have counters lit from below, you'll see guests holding their drinks over the various lights and colors to see how they look through different glasses. It can be mesmerizing." When asked what his favorite project is, Cohen responds with a wink and a smile, "My next project is always my favorite". As an environmentalist artist, he enjoys working with recycled materials and seeks opportunities to work on a grander scale. He is currently seeking high profile projects at wineries, public art displays, restaurants, and bars. Cohen, an accomplished sculptor and ceramicist, perfects his techniques in his home studio, which is fully outfitted with a potter's wheel, three kilns, slab rollers, a clay extruder, and a wide assortment of casts and molds. His work has been featured in numerous national media including the book Ultimate Outdoor Kitchens by Michelle Kodis and HGTV's recent special, Sizzling Outdoor Kitchens. What's next on his "to do" list? Well, Cohen does have some very interesting custom design ideas up his sleeve for the right winery.